With its rich finishes and sleek contemporary lines, the spacious Gordon 5-Drawer Chest will enhance any bedroom. The absence of a kick plate gives the chest a distinctively light and airy allure while the attractive L-shaped metal legs and angled metal handles accentuate the modern design. 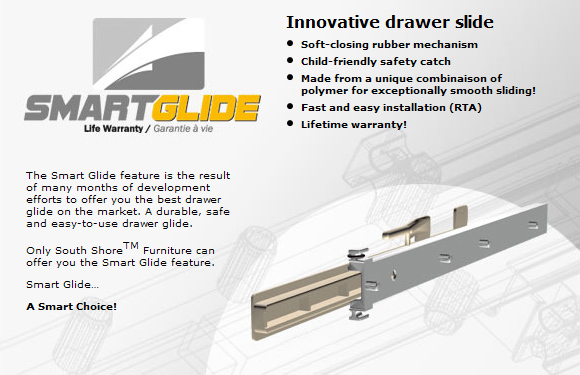 The angle of the handles make opening and closing the drawers a breeze. This warranty is only valid for purchases made at an authorized retailer for South Shore Furniture in Canada or the U.S. This item will ship curbside delivery with one of our LTL shipping partners (curbside delivery to certain areas excluded; please call for details regarding your specific delivery location). Estimated delivery time is 7-10 business days.